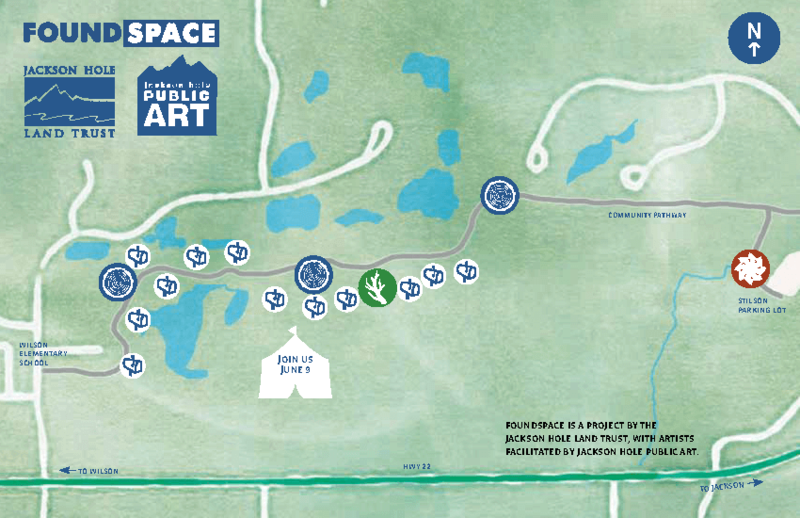 The Jackson Hole Land Trust in partnership with Jackson Hole Public Art invites the community to join five local artists for the third year of FoundSpace to explore open space and interact with art installations at JHLT easementprotected properties Wilson Centennial Ponds and Hardeman North Meadow. To celebrate the crossroads of art and conservation, FoundSpace brings together open spaces and public art in an accessible, family-friendly venue. The 2017 FoundSpace celebration will take place on Friday, June 9. The community is invited between 5 PM and 8 PM to join the celebration, engage with the five local FoundSpace artists, and watch the full moon rise along the community bike path at Hardeman North Meadow, between Stilson Lot and the Wilson School. The unveiling of the art installations will feature local food from the Café Genevieve truck for $2, free refreshments from Melvin Brewing, and live music from One Ton Pig. The first 200 event attendees to visit all four of the art installations will also receive a custom, limited-edition FoundSpace hat featuring artwork by Abby Paffrath. The FoundSpace installations will remain in place until the day after the Jackson Hole Land Trust Annual Picnic on August 13.